The myth that biofuels is a choice between food versus fuel is still perpetuated regardless of scientific data showing otherwise. The true fact about biofuels, including biodiesel, is that they produce food AND fuel. 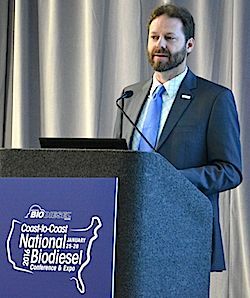 #Biodiesel’s role in both providing food and fuel, as well as in reducing carbon, were the topics of a presentation by Don Scott with the National Biodiesel Board (NBB) during the 2016 National Biodiesel Conference in Tampa, Florida. Biodiesel complements the fuel supply. Solar energy is abundant and efficient. Mitigating climate change does not cost. It pays. Biodiesel, said Scott, produces protein as a byproduct, an essential source of nutrition for humans. However, protein is expensive. But because biodiesel production only uses the oils (fat), protein is produced at a lower cost than average protein sources on the market. Based on this fact, Scott had a motto, per se, during his presentation: “When we grow protein to feed the world, we naturally get more carbs, fat, and other fiber byproducts than we can eat.” Therefore, he said, it makes sense to use this excess fat to displace petroleum, and biodiesel is the best example of nature’s design for food and fuel. And an added bonus, while today biodiesel represents about 20 percent of the renewable fuel market, it provides 40 percent of the carbon reductions as a result of using these renewable fuels.